Wishes you a very Merry Christmas 2013 and a Happy and Successful year 2014! We appreciate your continued support for our activities. at her 20th anniversary. Dec. 6th, 2013. Free Entrance / Donations accepted. The Swiss Cultural Association Na Bolom.ch invites you to honor the memory of Gertrude Duby Bolom who died at almost 93 years of age in December 23th, 1993, in San Cristobal de las Casas, in the Mexican state of Chiapas where she lived and worked since 1943. Duby Blom, a famous ethnologist and photographer, spent five decades fighting for the respect to the great Lacandon rainforest, one of the only two lungs in the American continent. In her native Switzerland she studied Horticulture in Niederlenz and Social Work in Zurich, two abilities she put to good use in Europe and in Mexico. Trudi, as she was known, is considered the very first real ecological spirit in the world. At the event, America Croisier will deliver her conference “Rencontres Forestières: Des cultures différentes pour une même passion” and Kyra Núñez-Johnsson will introduce “The life of a legend” a photographic show of Duby Blom’s long life. Na Bolom.ch will participate in the mexican celebration of the “Day of the dead” organized by the Mexican Embassy in Switzerland. A mexican altar will be presented in the Embassy and will be dedicated to Mr. Gilberto Bosques and Mrs. Gertrude Duby Blom. The mexican newspaper “La Jornada” published yesterday an article about the creation of Na Bolom.ch signed by Gabriela Sotomayor from news agency Notimex. 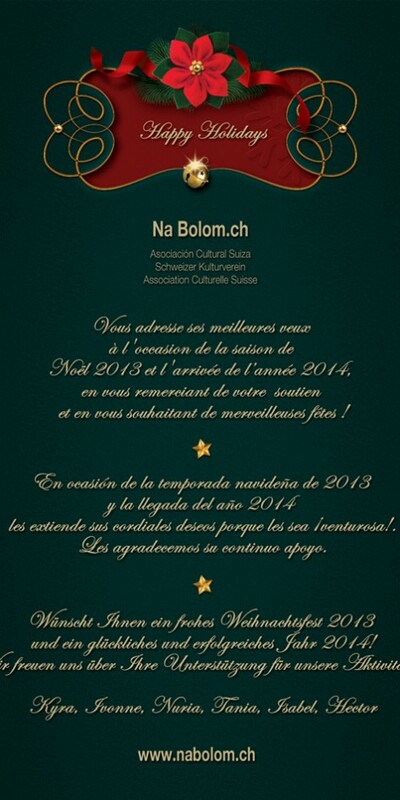 On September 12th the Cultural Association Na Bolom.ch was officially inaugurated in Bern. The non profit, cultural and ecological organization was created in honor of Gertrude Duby Blom, the “First Woman Ecologist in the Americas”. In the picture: Matthias Lörtscher, nephew of Trudi, Honorary President of Na Bolom.ch; Rudolf Knoblauch, Ambassador of Switzerland in Mexico; Tania Michel-Blanco, Communications Manager; Nuria Font de Berlioz, Secretary General; Jorge Castro Valle-Kuehne, Ambassador of Mexico in Switzerland, Kyra Nuñez-Johnsson, President of Na Bolom.ch; Ivonne Meyer, Vicepresident of Na Bolom.ch; Ana Isabel Campus, Treasure, and Héctor Pineda Moreno, Accounts Checker. 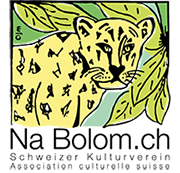 On October 16th, a lecture on Gertrude Duby Blom will be dictated by Mrs. Kyra Nuñez-Johnsson, president of Na Bolom.ch at the Museum of Swiss in the World as part of a program dedicated to the Swiss in the Americas. All info from the museum, here.